In some ways, the United Kingdom (England, Northern Ireland, Scotland and Wales) sweeper market is a microcosm of the diverse conditions found in the U.S. For example, some parts of the country have an enormous land area and a sparse population. In others, large populations are living in small geographical areas. As you might predict, this means that the amount and type of sweeper usage changes from area-to-area, as well. The United Kingdom is a relatively conservative nation, and naturally resistant to change. Yet, conversely, it's clear there's no moss growing on its current leaders, according the comments I heard at the Association for Public Service Excellence conference in Scotland, one of the most conservative areas of the U.K. They are now using a variety of technologies and information to advance their decision-making ability, and are gearing up for the changes required to assert themselves in their expected leadership role in the European Union. Membership in the E.U. is now mandating change faster than ever before, and there's no question it's a factor that's currently driving them. 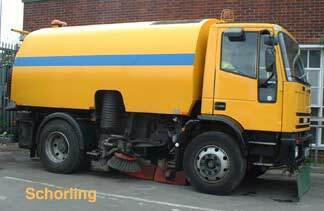 For example, let's consider the niche of truck-mounted road sweepers. Over time, the country has had relatively few makes and models of road sweepers to choose from, compared to the U.S. marketplace. Johnston's vacuum technology, which has never been particularly competitive in the U.S., has dominated sales in the U.K. for the past 25 years. 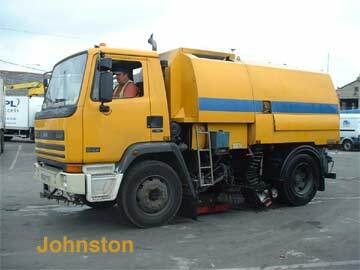 Johnston is headquartered in the U.K., and its closest competitor, Scarab (also built in U.K.), only offers a sweeper model with a hydrostatic transmission. Thus, Johnston currently has an estimated 80% market share while Scarab has garnered about 15%. The remaining 5% of the market belongs to two other companies. Schmidt, which for years was built in England, recently moved its manufacturing operation to Poland, to the detriment of its already miniscule market share. The sweepers made by a company called Schorling, and built in Germany, are holding on to their tiny market share. Until recently, if councils were interested in purchasing a large road sweeper, those four manufacturers offered the only options to choose from. Schwarze Industries' Australia operation entered the U.K. market place a little less than a year ago. Since vehicles in both countries drive on the left side of the road, and because both countries have similar road composition and design rules, Schwarze representatives felt the U.K. was a natural expansion target. Also, the current market segmentation in the U.K. closely resembles that of Australia's when Schwarze began offering its regenerative air technology in that country in 1997. At that time, Johnston had approximately 80% of the market share and Scarab had most of the remaining 20%. Remarkably, just 6 years later, Schwarze has captured over 50% of the total road sweeper market in Australia. Inexplicably, in 2004 the Schwarze organization pulled out of the U.K. market after only 2 years there. Since they had educated the U.K. marketplace about regenerative air sweeping technology while they were there, this left the door open for other manufacturers. Elgin is now making its presence known in the U.K. sweeping arena. This will no doubt shake up the European market for sweepers. Plus, with Johnston being sold in February of 2005, it's anyone's guess what may happen with their product line and marketing plan. The regenerative air concept is radically different from anything previously seen in the U.K. market. It's success and acceptance there remains to be seen, since the competition between regenerative air and vacuum-based has only recently begun. However, it's important to note the growing preference for regenerative air technology in the U.S., in the wake of greater emphasis on sweeping by the U.S. Environmental Protection Agency's Clean Water and Clean Air Acts. And, as the U.K. continues to be faced with the same types of environmental challenges that have furthered the growth of regenerative air technology in the U.S., it seems clear there will be a shift in the preferred technology of the large, chassis-mounted sweeper segment of the European marketplace.